Jim Dale is a showman of the old school; a true renaissance performer. He’s won a Tony, two Grammys, and four Drama Desk Awards. He’s received countless other nominations, including an Academy Award nod for the song “Georgy Girl,” later a huge hit for The Seekers, back in 1966. He’s been a pop star, a radio DJ, an actor of stage and screen, a voice artist, a playwright, a producer, a stand-up comedian, and many other things besides. Your smaller relatives will recognise him instantly as the voice of the American Harry Potter audiobooks. New Yorkers will remember his performances in Barnum (for which he won the Tony), The Threepenny Opera, Me and My Girl, Candide, and A Day in the Death of Joe Egg. The Brits among you will be familiar with his eleven-film run in the Carry On series of comedies. When I spoke to Jim last week, it had just been announced that his one-man show, Just Jim Dale, which played to excellent reviews for the Roundabout Theatre Company on Broadway last year, will transfer to London’s West End in May. Charles Arrowsmith: Many congratulations on the forthcoming West End transfer! What are you looking forward to most about bringing the show to British audiences? Jim Dale: I haven’t been onstage in England since 1996, and even then I was covered in fur and a beard playing Fagin in Oliver! at the London Palladium… People came to see me and they didn’t see me; they just saw a face full of whiskers! So it’s going to be nice to be back there, and as myself, not as a character from a film or a play; just me being Jim. I have so many friends in England who’ve been dying for this to happen over the last fifty years, and finally it has — before all of them kick the bucket. Including myself. CA: And in the theater where you made your West End debut. JD: I did a musical there called The Wayward Way. We opened at the Vaudeville Theatre, but unfortunately had to come off because Winston Churchill died that week. As a mark of respect, no one went to the theater for two or three weeks. Most shows in the West End had to come off. CA: Many of the guests at the House of SpeakEasy this week will know you best from your stage work on Broadway. What’s your happiest memory onstage? JD: I’m very careful. I turn down most material, either because it’s not the right material for me, or it’s not a well-written piece. I’m very picky and choosy. And that’s paid off very well indeed. People known damn well if they go to the theater and I’m in the show that it’s going to be very special. Not necessarily the performance from me! But the play has been selected for being worthy of a good audience. Until your own judgment lets you down, you go along with it. And that’s how I approached Just Jim Dale: looking at it with a critical eye and saying, Is this good enough? Will it work? CA: It’s a great survey of your career. Are there corners of your career that hold a special place in your heart that you feel go neglected in profiles of you? JD: It’s very difficult to squash seventy years of showbusiness into an hour and a half. I was a BBC disc jockey for over a year, on Saturday morning’s Children’s Favourites. I was a disc jockey on Radio Luxembourg — remember the ship moored off the coast? It was all new to people, being able to hear pirate radio. Those are the days I never mention. I concentrate on what I think will be appealing to an audience. When I did Just Jim Dale on Broadway, I didn’t even mention the Carry On films, and I was involved in them for over ten years. Mainly because American audiences don’t really know what the Carry On films are, or mean to the Brits. They’re very seldom seen over here. CA: Will the Carry On films be back in the London show? JD: Oh yes, of course — I’d get lynched if I didn’t do that! There are tens of thousands of ardent Carry On fans who’ve been watching the films in England two or three times a month — or a week — for years. They’re as popular in England as M*A*S*H is over here, or I Love Lucy. The I Love Lucy aficionados know every word in every scene; they love it so much. And it’s the same with the Carry Ons. I’ve seen people get up and recreate whole scenes. It’s amazing. In Harry Potter, we called them Potterheads, so I suppose these are the crazy Carry On-heads. They’re wonderful. They’ll do anything to see one of their idols. I still get fan mail galore sent over by my London agent. CA: On the subject of Harry Potter, I read that you held the Guinness World Record for the number of characters created for an audiobook with 134. JD: That’s right, and then with the next book, I broke the record with 147 characters! For a time we also occupied the first six places in the top ten audiobooks in America and Canada — another record. CA: How do you go about preparing to record something like that? JD: As a narrator you read through the script with a small tape recorder by your side, and when you get to the first character you note it down. “Character #1: Dumbledore. Old teacher.” Then you press your tape recorder, and record the voice of Dumbledore, reading his first sentence. By the time you finish, you’ve got 147 different voices on that tape. So when you’re recording and get to a new character and can’t remember who that one was, you can reel through the tape until you find the voice you invented two or three weeks ago. Hundreds of times you stop and start. The brilliance of audiobooks is down to the editor. He’s the one who makes it look as if it’s all one take. These are very clever people! I just raise my hand and salute these guys. They make it sound effortless. With the early Harry Potter audiobooks, the books were already published. Later on, we had to record them so they could be on the shelf the same day as the latest book. If we didn’t, the children who’d been listening to the previous audiobook couldn’t wait and they’d buy the book instead. When I went into the studios to record the book, I was experiencing the story for the first time. And in the audiobook world, unlike film or television, it’s one take. Until you make a mistake — or swear! — you keep going. That’s why I’ve never heard one of my audiobooks, and I’ve done over forty of them: because I’d want to do them again. CA: Presumably you had to sign non-disclosure agreements? JD: Absolutely! There was one time, with the last book, when everyone was waiting for it, I was the only one in America with a copy of it. I wanted to stand on top of the roof screaming, “I’ve got it! I’ve got it!” But I wasn’t allowed to do that. CA: What was the last great book you read? JD: It was Rough Crossings: The Slaves, the British, and the American Revolution by Simon Schama. 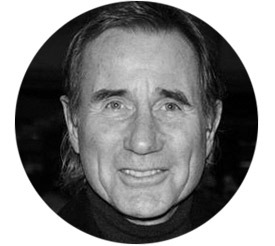 Jim Dale will appear at Runnin’ Wild, the House of SpeakEasy Gala, on January 28 at City Winery. We will return to our regular pricing for our Seriously Entertaining show No Return on March 9.